Can I Still Get A DUI With An Ignition Interlock Device? While ignition interlock devices do deter most people from drinking and driving, the quick answer to the question is yes, you can still get a DUI with an ignition interlock device (IID) installed in your vehicle. Wait! How can this happen, you say? Well, if you’re intent on drinking and driving even if you have an ignition interlock device installed, you can do it. During a rolling retest, if you blow above the breath alcohol content (BrAC) for your program, you are violating your program. But for safety reasons, the IID does not shut down your vehicle in the middle of traffic. The device is hooked into your starter — not the engine itself. You could also skip the rolling retest because you’ve been drinking. 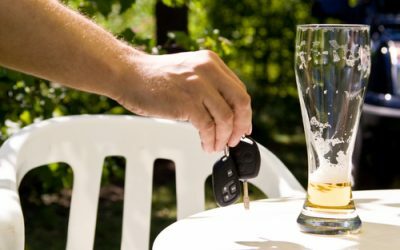 So technically, you could be drinking and driving and an officer could pull you over and charge you with DUI (alcohol) even if you have an ignition interlock device installed in your vehicle. But even if you aren’t pulled over for DUI, your ignition interlock device will record the violation, and it will be reported to your monitoring agency. While state ignition interlock device laws differ, some states only allow you one program violation before the IID locks you out the next time you try and start the car, requiring you to go in for an unscheduled visit to your IID ALCOLOCK service center. Just one program violation can result in increased penalties. And a repeat DUI can have very serious consequences. And did you know that in some states, you can be charged with DUI even if you’re not driving? Let’s say you had a couple of drinks and you know you shouldn’t drive. So you’re sitting there in your car waiting. If an officer stops by to check and see if you are OK, and determines you’ve been drinking, you can be charged with DUI, under the principle of Physical Control. All it takes is for you to be in the driver’s seat and have possession of the car keys. They don’t even have to be in the ignition. If you have the urge to drink, be smart. Do yourself a favor and have someone else drive, or call an Uber. Complying with your ignition interlock device program can help you get your full driving privileges back in the least amount of time. And while a lot of people think of DUI and drunk driving as one and the same, a DUI charge can relate to a number of other substances besides alcohol. DUI stands for Driving Under the Influence. That can be under the influence of alcohol, but it can also be under the influence of any number of drugs, both legal and illegal. Law enforcement and the courts will deem you to be driving under the influence if the substance has adversely affected your ability to drive safely — it’s made you drowsy, or affected your coordination such that you may be weaving across the center line, weaving off the road, running a red light, etc. You can be pulled over for any traffic violation, or even if you have a burnt out tail light or headlight. Once you are stopped, if the officer suspects you’ of driving under the influence, they can administer various field tests. The bottom line is if a substance affects your nervous system and your ability to drive safely, you can be pulled over and charged with DUI, whether you have an ignition interlock device in your vehicle or not. If you are charged and convicted on a DUI Drugs offense, you will need to consult with your DUI lawyer and your monitoring agency to see how this might affect your restricted driving program. Once again, state laws differ. At ALCOLOCK, our goal is to get your ignition interlock device installed quickly and easily, and help monitor your progress in your DUI/DWI restricted driving program. We partner with you to help you get your driver’s license reinstated and get your life back to normal. Call ALCOLOCK at 866-700-9300 if you have questions, or use our contact form to schedule your IID installation.